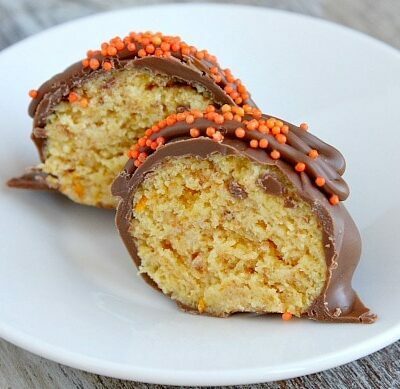 Butterfinger Truffles are a rich and chocolatey truffle with chopped Butterfinger candy bar mixed in. 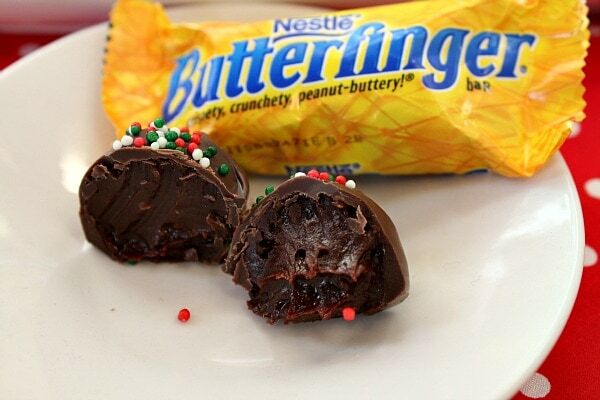 They’re dipped in chocolate and topped with more Butterfinger. Do you have a vision for the perfect sort of chocolate dessert? Is it a velvety chocolate pudding or a chocolate- chocolate chip cheesecake? Is it rich chocolate ice cream topped with thick hot fudge and chocolate sprinkles? Or is it something as simple as a piece of chocolate cake with a thick layer of chocolate frosting? 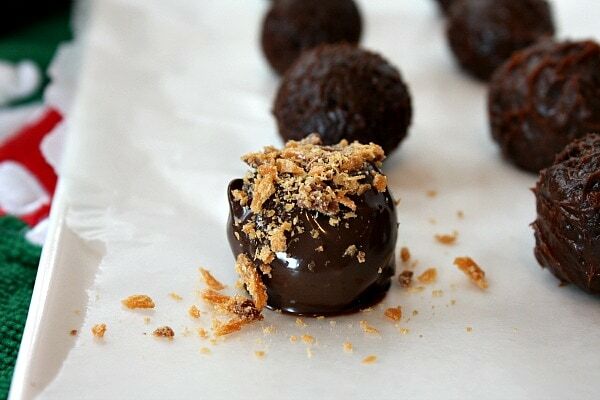 I’m not much of a chocolate-girl myself, but if I were to envision the most perfect bite of chocolate ever, it would be what is found in these Butterfinger Truffles. I can’t wait to show you what’s inside of them. These are for chocolate lovers only. 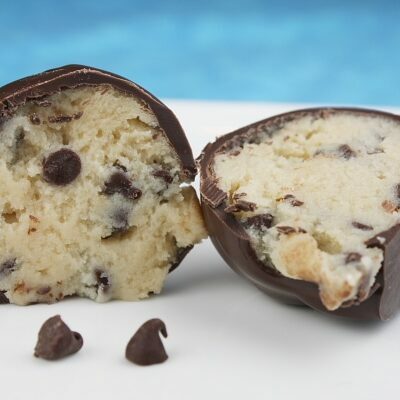 There is a hard shell of chocolate surrounding the outside, and the interior is a soft bite of chocolate heaven. Can anything go wrong with dessert when Butterfingers are involved? I think not. Here’s a visual of the process of making the interior truffle part- that soft bite of chocolate heaven that I mentioned before. Chocolate- Butterfinger Heaven. 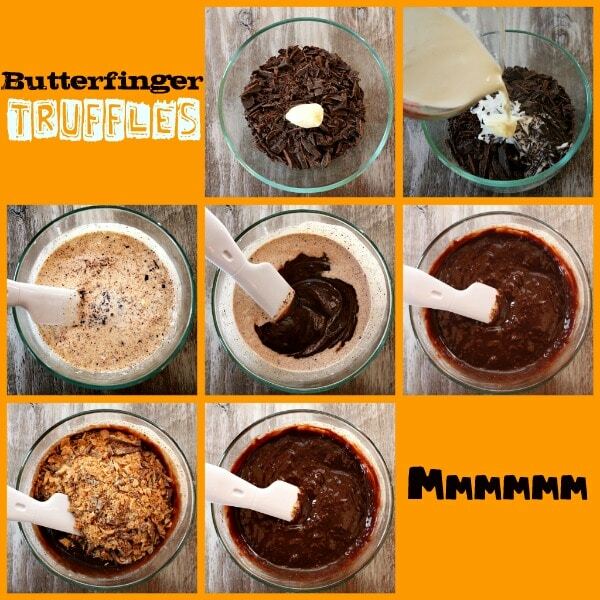 After making the truffle mixture, you’ll refrigerate it until it’s slightly firm. Firmed up chocolate truffle is rolled into balls. This is the very messy part because you’ll be doing this with your hands. The chocolate truffle will want to melt onto your warm hands, so just work quickly and roll gently. 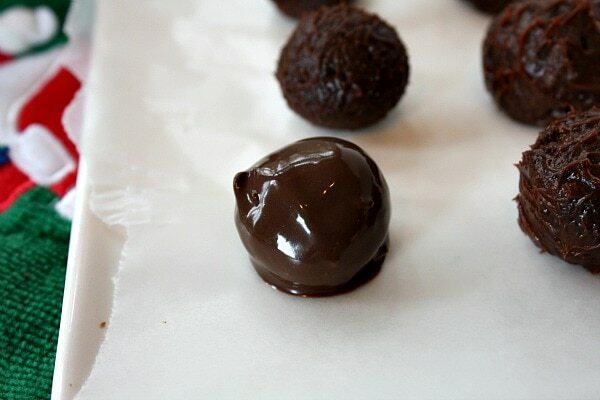 Then you’ll quickly dip the truffle balls in melted chocolate. And then place them on waxed paper. Before the chocolate sets, you’ll top these Butterfinger Truffles immediately with more chopped Butterfinger (or sprinkles, or whatever). These are a great little dessert for a holiday eve or party, where your guests can nibble them at random. And here is what you will find inside! There’s the soft bite of Butterfinger Truffles heaven I was talking about. It literally melts in your mouth when you bite into it. These will keep for several days when refrigerated. Make them small- because a little bit of this rich chocolate bite goes a long, long way! So what do you think? Does this qualify as the perfect sort of chocolate dessert? 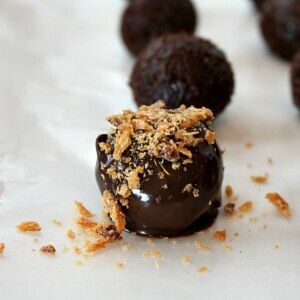 A very chocolatey truffle with Butterfinger candy bar mixed in. Place chocolate and butter in a medium bowl. Bring cream to a boil by using a glass measuring cup in the microwave. Heat 1 to 1 1/2 minutes, or just until the cream begins to bubble. Pour the hot cream over the chocolate mixture. Let it stand for 1 minute, then stir until the chocolate is melted and the mixture is smooth. 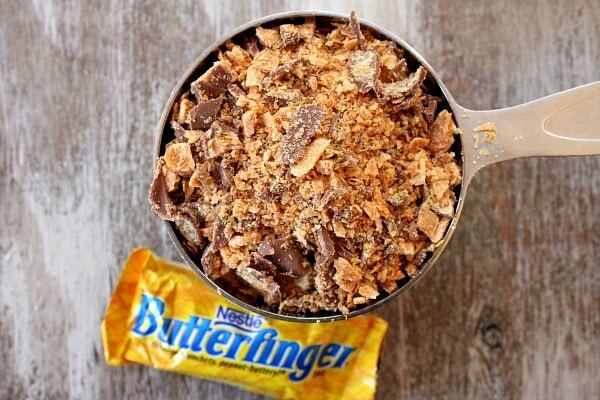 Stir in chopped Butterfinger. Cover and chill until this mixture is firm (at least 2 hours- and up to 24 hours). Line a rimmed baking sheet with waxed paper. Using a small spoon or melon baller, scoop 3/4-inch balls from the firmed-up chocolate mixture. Roll the chocolate gently between your hands to form a ball. It will be very sticky and messy. Place it on the prepared sheet. Continue rolling until you have used up all of the chocolate. Place the rolled balls back into the refrigerator to firm them up again (about an hour). 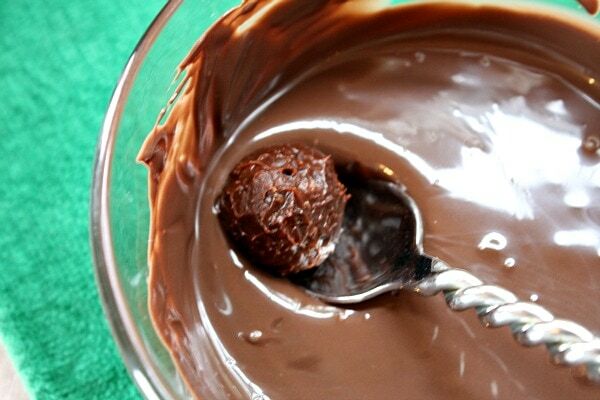 Melt some additional chocolate in a small bowl. I just used more of the semisweet chocolate that I used for the truffles. If you melt 1 1/2 cups at a time, that should work out fine. Melting in the microwave works great- just melt in bursts of 45 seconds, stopping after each burst to stir until all is melted and smooth. Remove the chilled chocolate balls from the refrigerator. 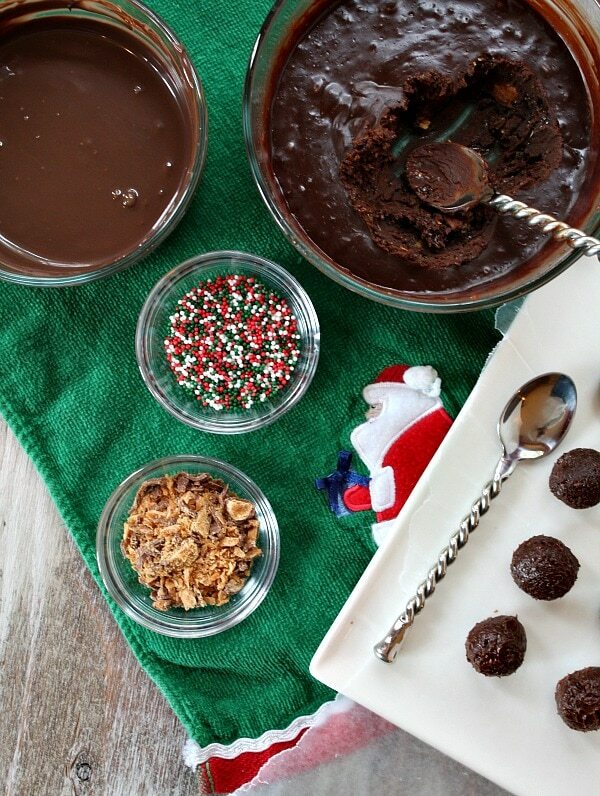 Use a small spoon to dip the chocolate ball into the melted chocolate. Use another spoon to help cover the ball entirely in a layer of chocolate, and then gently place the chocolate dipped ball onto the waxed paper. Immediately sprinkle chopped butterfingers or decorative sprinkles on top. Continue with remaining chocolate balls and decor. These truffles are best if kept refrigerated until they are ready to serve. They're not a great truffle for gifting in a box. 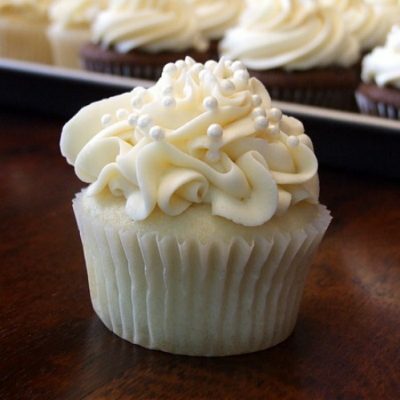 When you bite into them, you will notice how delicate they are. They have a hard chocolate exterior, but when you bite into them the interior will melt right in your mouth. These are heavenly. 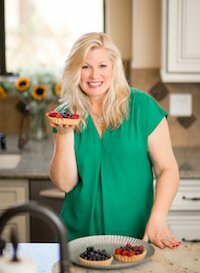 *If you are preparing this recipe as gluten-free, just be sure to use a brand of chocolate that is designated as GF. 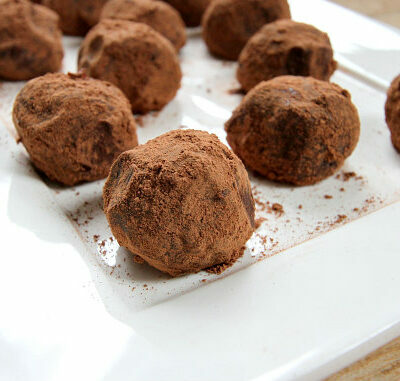 *If you don't wish to dip these truffles into chocolate, you may choose to roll them in unsweetened cocoa powder instead. 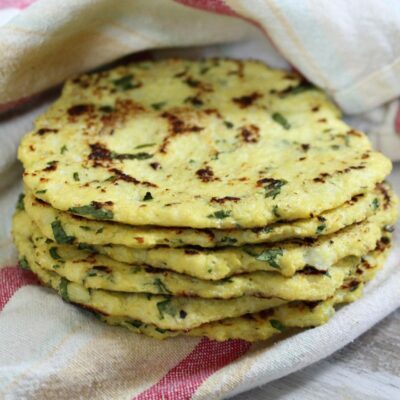 *The finished product will stay fresh and wonderful in the refrigerator for several days. I don’t know since I haven’t tried them! let me know if you experiment with Kit Kats and they’re a success! The best use of Butterfingers I’ve ever seen! Butterfingers are one of my very favorite candy bars – these are speaking out to me! Can’t wait to try these. Yummy!!! So far these are an epic fail for us; too gooey to roll, even after refrigerating. Trying the freezer now… Maybe more chocolate and less cream? Oh no! I have to say that they were very hard to roll, and very moist… but a gentle roll in the hands and a quick dip in the melted chocolate to create a hard exterior coating and they were perfect with a melt-in-your-mouth inside. Hope you got them to work out! Beautiful! 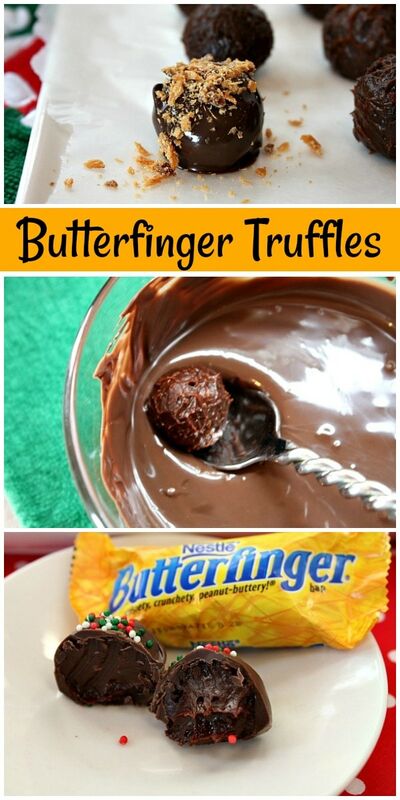 I love butterfingers and putting them with even more chocolate makes my day! These look EVIL Lori! I love anything Butterfinger. I have the same silverware !! 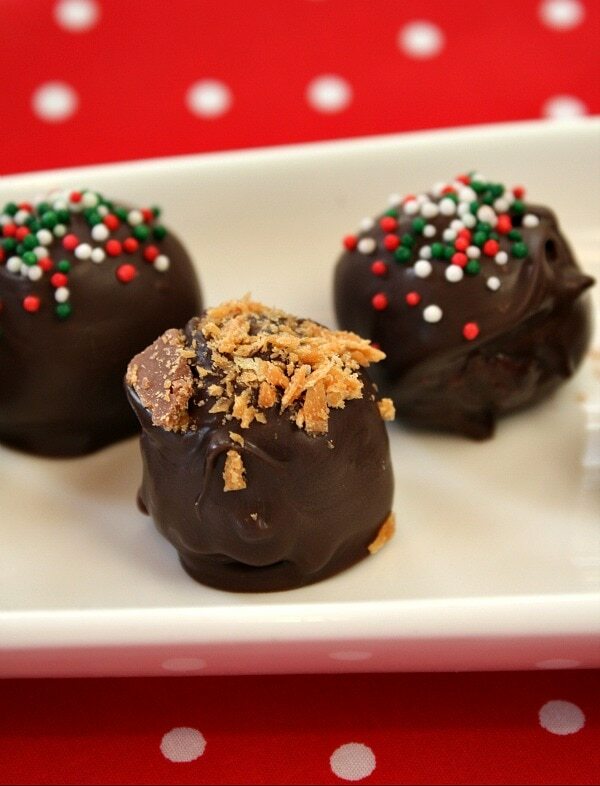 Truffles are my weakness and these look particulary amazing! I love any kind of truffle. Amazing! 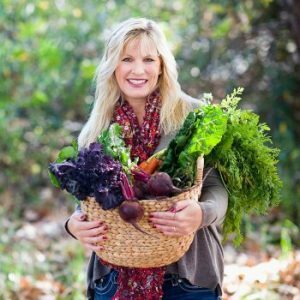 Thanks for sharing, friend! Merry Christmas! How did you dip them so perfectly? Whenever I dip there are strings of chocolate all over the kitchen, in my hair on my elbow, its a disaster. 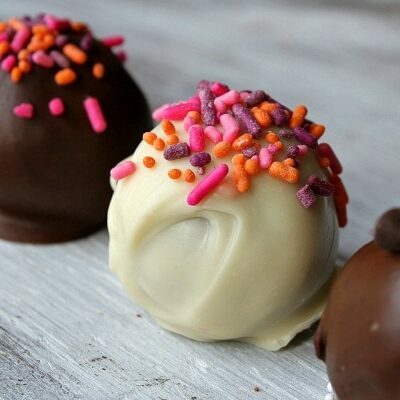 I have crafted the perfect plan for making these, make them at momma’s house a certified chocolate addict get her “drunk” on these truffels and then jump ship. The mix of creamy and crunchy textures are what makes these truffles so interesting to me. I am drooling. These look amazing! Oh my, those look amazing. So rich and decadent! 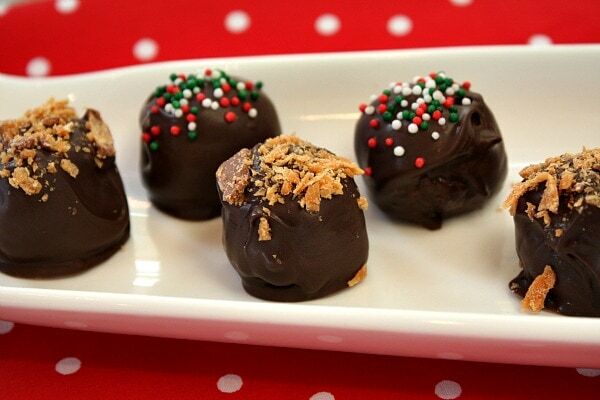 I love truffles, and these look amazing!